During the inaugural flight of Sikorsky's previous flying boat, the S-40, on November 19, 1931, the pilot and Pan American Airways consultant, Charles Lindbergh, who considered the S-40 a monstrosity, engaged designer Igor Sikorsky in a conversation about what he thought the next airplane should look like. The conversation continued that night at the hotel in Jamaica. Sikorsky argued that design development should be incremental and that the safe approach would be a larger S-40. Lindbergh argued that a sleeker design, with a range in still air of 2,500 miles, was needed. In June 1931 Pan Am president Juan Trippe had requested designs from six aircraft companies for an aircraft able to span the oceans. The new design would need increased lifting capacity to carry enough fuel and 300 pounds of mail, but no passengers, for a 2,500 miles (4,023 kilometers) nonstop flight against a 30 mph (48 km/h) wind, at a higher cruising speed than the norm for similar flying boats at that time. Of the six companies tenders had been sent to, only Sikorsky and Martin provided submissions. Sikorsky offered the S-42. The other offer was the more ambitious Martin M-130. The new Sikorsky design, the S-42, had major aerodynamic improvements over the S-40. Igor Sikorsky said, "in its very outline the S-42 represents simplicity. Diverting sharply from the past Sikorsky designs, external bracings have been reduced to a minimum. The tail, instead of being supported by outriggers, is attached directly to the hull." The S-42 had a high wing loading which required flaps to provide acceptable takeoff and landing speeds. Though Lindbergh approved of the S-42, it fell far short of his proposed range. Stripped of all accommodations, with extra fuel tanks in the fuselage, the S-42 was just able to fly proving flights across the Atlantic and Pacific oceans. Pan Am would have to wait for the Martin M-130 to have an airliner capable of flying the Pacific with a payload. 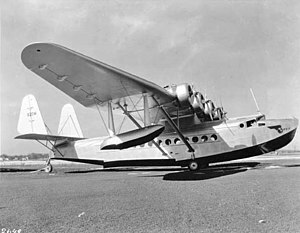 Pan Am's S-42s were used primarily on the Miami - Rio de Janeiro route. In 1937 S-42s also operated a New York-to-Bermuda service. 1940 saw S-42 flights between Seattle and Alaska. An S-42 was also used between Manila and Hong Kong. 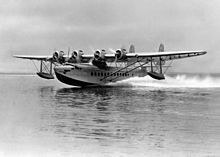 British Marine Aircraft Ltd. was formed in February 1936 to produce S-42A flying boats under license in the United Kingdom but nothing came of this. The company built a factory on the western side of the Hamble peninsula with a slipway to Southampton Water. When the deal fell through, the company was sold to Henry Folland, who renamed it Folland Aircraft Limited. Flying for Pan American Airways, a total of ten S-42s were built, manufactured by the Vought-Sikorsky Aircraft Division of the United Aircraft Corporation in Stratford, Connecticut. The prototype first flew on March 30, 1934. In early 1942 the U.S. Navy acquired one S-42 which it used as a transport in the Caribbean and to South America. All Sikorsky S-42s were either scrapped or destroyed in accidents. In 1947, inventor Lemuel Stewart purchased the fuselage of S-42 NC-822M Brazilian Clipper from Pan Am for $750.00, converted it to a six-room houseboat, and kept it docked in a boat canal in Miami, Florida. Its ultimate fate is unknown. Production aircraft with four 700 hp (522 kW) Pratt & Whitney Hornet S5D1G radial engines, three built: NC 822M, NC 823M, NC 824M. Production aircraft with four 750 hp (559 kW) Pratt & Whitney Hornet S1EG radial engines, longer wings and a 2,000 lb (907 kg) increase in maximum takeoff weight, four built: NC 15373, NC 15374, NC 15375, NC 15376. Production aircraft with aerodynamic improvements, constant-speed Hamilton Standard propellers and a further 2,000 lb (907 kg) increase in maximum takeoff weight, three built: NC 16734, NC 16735, NC 16736. Proposed licence-built variant of the S-42A, not built. On December 20, 1935, a Pan Am S-42 named Puerto Rico Clipper crashed on landing at Port of Spain, Trinidad & Tobago and sank, killing three of 25 on board. On April 11, 1936, a Pan Am S-42B named Antilles Clipper crashed on takeoff from Port of Spain, Trinidad & Tobago, killing three of 25 on board. The pilot swerved to avoid a fishing boat that was in his path but one pontoon struck the boat and the aircraft overturned. On January 11, 1938, Pan Am Flight 1, an S-42B named Samoan Clipper (formerly Pan American Clipper II), exploded near Pago Pago, American Samoa. The flying boat developed an engine problem shortly after takeoff. The pilot elected to dump fuel before making an emergency landing, but the aircraft exploded while fuel dumping was in progress. All seven crew members (including famous aviator Captain Ed Musick), died in the crash. On October 3, 1941, Pam Am Flight 203, an S-42A named Dominican Clipper, crashed on landing in the harbour at San Juan, Puerto Rico, killing two of 27 on board. After the approach to San Juan, the aircraft hit the water in a nose-low attitude while moving sideways; after the first contact the aircraft swerved violently to the right and broke apart. 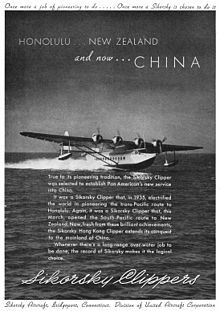 On December 8, 1941, a Pan Am S-42B named Hong Kong Clipper II (formerly Bermuda Clipper and Alaska Clipper) was destroyed on the water at Kai Tak Airport, Hong Kong, during a Japanese bombing raid. On July 27, 1943, a Pan Am S-42B named Bermuda Clipper (formerly Pan American Clipper III) caught fire and burned out while docked at Manaus; there was no one on board. On August 8, 1944, Pan Am Flight 218, an S-42 named Hong Kong Clipper (formerly West Indies Clipper and Pan Am Clipper I) on a return trip from San Juan to Miami with intermediate stops at Port-au-Prince and Antilla, Cuba, crashed shortly after taking off from Antilla. After striking, bow first, the flying boat left the water in a slightly nose-high attitude, then returned, and by the third time, stalled. There were 17 fatalities (all passengers) out of the 26 passengers and five crew. ^ a b c d "The S-42, The Development and Characteristics of a Long-Range Flying Boat (A presentation by Igor Sikorsky to the Royal Aeronautical Society, London, 15 November 1934". Sikorsky Aircraft. Retrieved 7 December 2015. ^ King, H.F. (1969). Milestones of the Air (McGraw-Hill ed.). New York: Jane's All the World's Aircraft Publishing Company. p. 80. ^ Fagan, Dave. "Hamble." Archived 2006-03-16 at the Wayback Machine Aviation in Hampshire UK 1900 to 2000. Retrieved: July 5, 2009. ^ "Clipper Conquers Pacific on Hawaiian Hops." Popular Mechanics, July 1935. ^ "Clipper Makes Home for Floridians." Wilbur Jennings via AP Newsfeatures, Paducah Sun-Democrat, Paducah, KY, April 30, 1947. ^ Donnelley, James E. "The Crash of NC 15376." webstart.com. Retrieved: April 3, 2010. ^ "Accident Sikorsky S-42 NC824M". Aviation Safety Network Wikibase. Retrieved 2018-11-29. ^ Accident description for NC824M at the Aviation Safety Network. Retrieved on 2014-6-24. ^ "Crash of a Sikorsky S-42B in Port of Spain: 3 killed". Bureau of Aircraft Accidents Archives. Retrieved 2018-11-29. ^ "Statement of Probable Cause Concerning an Accident Which Occurred to an Aircraft of Pan American Airways Company near Pago Pago, Tutuila, Samoa, on January 11, 1938". Department of Commerce Bureau of Air Commerce. Retrieved December 14, 2015. ^ "CLIPPER WRECKED, ALL 7 FLIERS DEAD IN SEA AFTER FIRE; Fragments of Big Flying Boat Are Found in Pacific 14 Miles From Her Pago Pago Base". The New York Times. January 13, 1938. Retrieved December 12, 2011. ^ "Statement of Probable Cause an Accident Which Occurred to an Aircraft of Central Airlines, Incorporated, at Pittsburgh, Pennsylvania, on November 16 , 1935". Civil Aeronautics Board. Archived from the original on December 22, 2015. Retrieved December 14, 2015. ^ Accident description for NC15376 at the Aviation Safety Network. Retrieved on 2014-6-24. ^ Accident description for NC16735 at the Aviation Safety Network. Retrieved on 2014-6-24. ^ Accident description for NC16736 at the Aviation Safety Network. Retrieved on 2011-12-12. ^ "Accident Investigation Report, August 8, 1944 Flight 218 of Pan American S-42 NC 823M". Civil Aeronautics Board. Archived from the original on December 22, 2015. Retrieved December 14, 2015. ^ Accident description for NC823M at the Aviation Safety Network. Retrieved on 2011-9-5. ^ Grey, C.G., ed. (1934). Jane's all the World's Aircraft 1934. London: Sampson Low, Marston & company, ltd. pp. 311c–312c. ^ McKinney, Michael. "Sikorsky S-42 Clipper History". The Flying Clippers. Retrieved 18 April 2019. Wikimedia Commons has media related to Sikorsky S-42.